The wind-up knight is back and he's ready to spring into action! Who is this nobleman that we speak of, you ask? Why, none other than the mechanical protagonist in Wind-up Knight 2. This is a fun and challenging game that feels like a mashup between an endless runner and a platformer. Your goal is to reach the end of each level in one piece, that is without being impaled by a spike or slaughtered by a monster. We know it seems simple enough, but in reality, it isn't. You see, you can't tell the knight where to go – he just runs down the track at his own pace. You can, however, make him jump, slash with his weapon, or roll below obstacles. Fast reflexes are of utmost importance for beating a stage flawlessly. 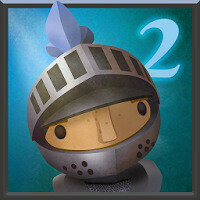 Coins are placed strategically across the stages in Wind-up Knight 2. These are collected not just for bragging rights, but also for buying new gear from the game's store. Some items are just for showing off. Others, however, have special properties – a special helm, for example, will let you recharge your wind-up spring once per run. When you're tired of the standard game mode, you can go back to the stages you've already beaten and to complete side quests. The tournament event is also a pretty neat option as a new challenge awaits every day. Plus, you can invite your friends and play on just one life. While the action in Wind-up Knight 2 takes place in a dimensionally limited environment – you only go left, right, and up or down occasionally – the game features quality 3D graphics. It isn't too fancy, however, and you don't need a high-end smartphone or tablet to run the game smoothly. That's Wind-up Knight 2, in a nutshell. It is available on both Android and iOS for free (kind of) so you can definitely give it a try. Just keep in mind that unlocking the complete version of the game with all its stages will cost you money. Where are you from butthurt a**hole.? Hmm.. yes And this is my personal opinion that this game provides nothing extremely exciting or new. There are 1000s such games in the appstore with a person running and tackling enemies with just 2-3 button control. Since games land only on iOS and android .. I assume there are no good games in the world. !